The Social Justice Group is a significant contributor to the activities of the Bendigo Uniting Churches Social Justice Group (BUCSJG). The BUCSJG meets on the last Wednesday monthly at 5pm at the St Andrews UC complex. Click here to visit the BUCSJG page on the Bendigo Uniting Churches Network website. 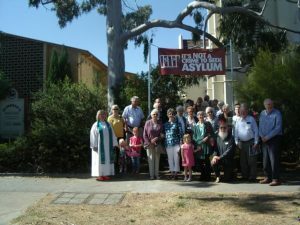 The St Andrews UC faith community celebrates displaying a banner protesting the Federal Government’s policy on Asylum Seekers & Refugee re-settlement. This is one of four different banners being displayed at Uniting Churches around Bendigo. They will be rotated quarterly. 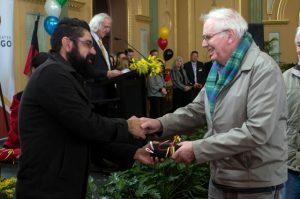 On behalf o the St Andrews UC faith community Bruce Keeling receives the Australian Indigenous flag from Trent Nelson at the 2016 NAIDOC Flag Raising celebration. The flag now flies permanently at St Andrews UC.